Once you reach level 8 in Rangers Of Oblivion game, the first profession; cooking will get unlocked and you will be able to cook a variety of dishes. These dishes grant combat buffs; increase in armor, health, attack, and many more. The two more professions are hunter and exploration. Hunter profession unlocks at level 23, while exploration profession unlocks at level 13. In today’s post, we have covered the cooking profession and how to master it. To learn new dishes, you must reach a certain mastery level. Tap the menu button -> skill -> at the bottom, tap the profession button -> gourmet -> learn -> tap the dish icon and hit the learn button. It will cost you a set amount of silver coins. You need gourmet points to increase the Gourmet mastery level. The player gets these points when he/she cooks the various dishes at cooking centers. 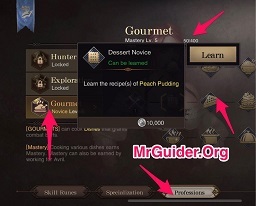 Head to the professions menu again and choose gourmet -> there you can check the gourmet mastery level and the number of points required to reach the next mastery level. First of all, visit an NPC who lets you cook the dishes. 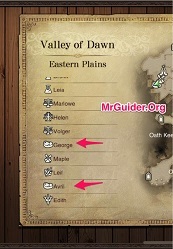 Tap the mini-map and on the left side, from the NPCs list, find farmer or cooking shops. For example; In the Valley of Dawn, visit Avril or George. There would be a food plate type symbol next to the NPC name. Tap his/her name and the character will automatically visit there. Interact with the NPC and choose cooking. Select a dish, for example; Apple Jam. Then tap the “make this dish” button and craft. On the crafting screen, you can check the ingredients. 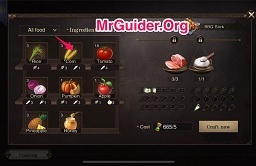 If you don’t have, then tap the ingredient -> obtain -> the game will show you the list of locations where you can get the ingredient. You can get some ingredients from the cooking shop, farm, and hunts. You also need Vigor to cook dishes. If you visit a farmer and interact with him, you get the option to request crops. Use the seeds and plant the vegetables, fruits. You will save some silver coins, but it takes time and you must take care of the crops. Tap the crop to check the status. If something gets wrong(due to pest, fertilizer), you will get the message in the email. You can buy the seeds from the farmer(request crops -> seed -> buy) in exchange for friendship points or silver coins. You should consume these food dishes before you embark on a dangerous stage. Tap the bag button at the top of the screen -> go to items tab -> cooking -> tap the dish -> use.